A self-taught artist, Baron first began making collages from torn paper, cloth, inks, and watercolors. By the late 1960s, she began applying symbols and hidden language to a series of box constructions crafted from found wood, cloth, string, and toys. Tied shut with knotted cloth, string, and wire, the wooden assemblages function as safeguards of ideas, memories, and feelings. 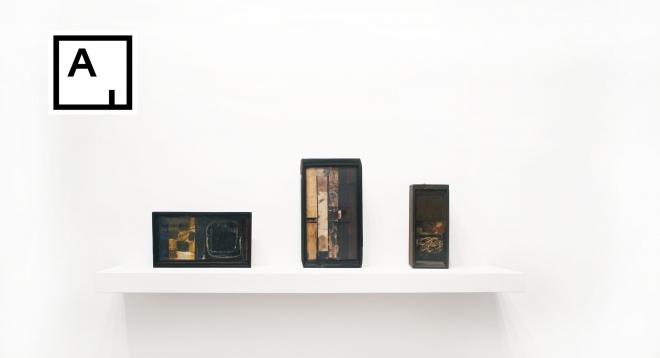 At Leslie Feely Gallery, a number of the artist’s previously unseen box works are on view in “Collages and Box Constructions.” Small in scale, commanding in presence, the works draw the viewer in and resonate on a deep, emotional level. Their seemingly haphazard chipped wood and torn edges suggest fragility and the passage of time. Baron’s works do not seek to express a singular message, but rather invite the viewer to peel apart each artwork’s many layers and find his or her own unique interpretation within. Baron’s work is greatly influenced by her personal history. Born in Germany in 1926, she suffered from depression for much of her life, likely a result of Holocaust trauma. She was prone to nervous breakdowns and, toward the end of her life, grappled with cancer. Her art was a vehicle through which she expressed herself as she worked with everyday materials to unfurl the fragile, fraught human condition, as well as her personal concerns related to the environment, war, and social movements. Like time-worn ancient relics, her work captures and consecrates feelings, memories, thoughts, and moments in time, simultaneously containing and liberating them.